Summertime is known for vacations, running through the sprinklers, tanning at the beach...and for hot fish tanks. If there is no room in your budget for a chiller, here are some "stay cool" tips for the steamy months ahead. Even if you run a chiller, it's always better to be prepared in the event your equipment should fail. If you are in the pre-tank planning stage, or your tank is small enough to be moved safely, place the tank in the coolest room in the house. Basements are particularily cool although not always the most attractive place to view your aquarium. Rooms with southern exposure tend to be warmer than the rest of the building. Air conditioned rooms and homes are even better. At the very least, place the tank out of direct sunlight to minimize heating. Even if your tank is not in direct sunlight, close the blinds through the day. An uncovered window will increase room temperature a couple of degrees. Heat reflecting window films and even awnings can help cool a room as well. They can be used to deliver cooler air to the tank, pull warmer air away from the tank and, when properly positioned, can significantly increase evaporative cooling. Mounting a fan on one side of the tank or sump to blow air over the water's surface towards the opposite side will optimize this technique. Better yet, adding an exhaust fan that will remove warmed air from the area around the tank or from the canopy is helpful. Fans designed for use on a fish tank can be clipped easity onto your aquarium. They can be made with computer fans (instructions found here). 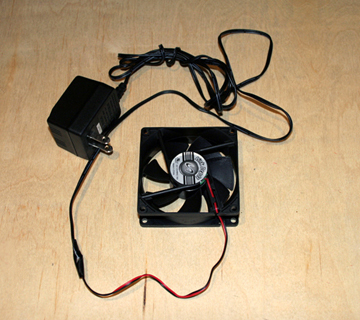 A handy fan can be made using a computer fan, an adapter and some tape. In certain instances, common household fans can be used easily and cheaply. 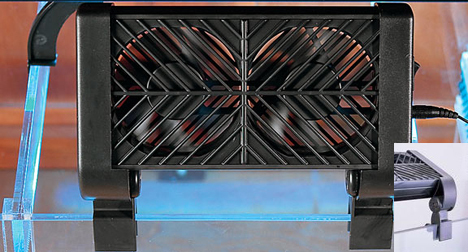 A large fan near or clipped onto the sump can drop the temperature a couple of degrees. Pedestal fans work nicely on taller setups. Increasing surface agitation will maximize the evaporative cooling effect, so drop an airline into the tank if possible. 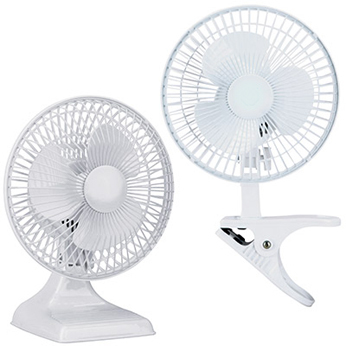 There are a variety of household fan styles that can be used a number of different ways to suit your needs. If there are acrylic or glass covers on the tank top, remove them. These can be replaced with eggcrate or a similar product if there is a risk of a fish jumping out. If there is a hood that can be removed or opened, do so. If your system has an in-stand sump/refugium, and there are there are doors in the stand, open them up to increase airflow over the sump. Open the tank as much as possible to increase airflow. An open stand and hood will help bring down the heat. Remove or alter heat producing equipment whenever possible. Don't use more light than necessary for the critters you keep. Raise the lights whenever feasable to increase the distance between the water surface and the lamps. Decrease the photoperiod and/or change the times the tank is lit to either the coolest part of the day or in the evening. Check the power used by pumps and powerheads. Higher wattage pumps run warmer, which in turn, warms the water. 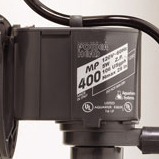 Some pumps are rated much lower than others while maintaining the same amount of water flow. 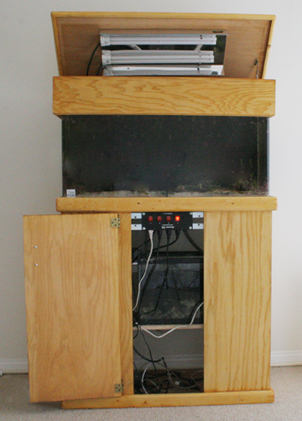 If you run a UV sterilizer, make sure it isn't adding too much heat to the system. Get the appropriate size for your system rather than oversizing it. 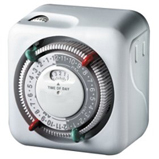 As with other electrical equipment, higher the wattage of the UV tube, the hotter it runs. Simply reducing the number of hours a day your lights are on and the amount of power a pump uses will reduce the temperature of your system. 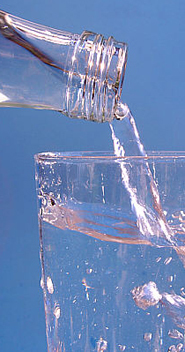 Fill plastic containers or jugs with water and float them in the aquarium. Water and soda bottles work well for this. Keep one in the freezer and one in the tank for easy switching. Be sure to use top off water or saltwater in case the containers spring a leak. 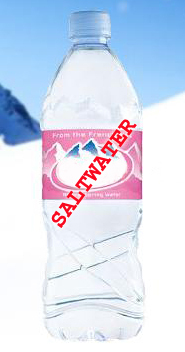 REMEMBER: If you fill the bottles with saltwater, be sure to label them appropriately so a family member won't make a salty tasting mistake! Ice cubes made with RO/DI water will work in a pinch but is very labor intensive. You have to watch the salinty closely with this method, however, this is usually not an issue with all the evaporation taking place. Enjoy the summer heat while keeping your aquatic critters cool.